"Kaleidoscopic XVI: More is More"
Copyright 1996 Paula Nadelstern. 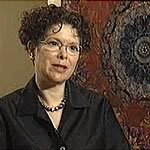 64" x 64"
Paula Nadelstern is is the author of two books: Kaleidoscopes & Quilts and Snowflakes & Quilts. 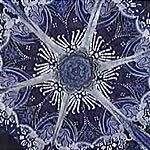 Her goal in creating her kaleidoscopic quilts is to "harmoniously integrate the idea of a kaleidoscope with the techniques and materials of quiltmaking." "I try to free myself from a conventional sense of fabric orderliness, seeking a random quality in order to imitate the succession of chance interlinkings and endless possibilities synonymous with kaleidoscopes. "I've been making kaleidoscopic quilts for more than ten years now, and Kaleidoscopic 16: More is More is the 16th in a series, I am currently making the 23rd in the series. I started out making extremely simple quilts, it wasn't until the 4th or 5th quilt that I actually saw a state-of-the-art kaleidoscope. "So the first, numbers one to five are really what I imagine putting fabric together in a specific way will give you a kaleidoscopic image. I mean each quilt leads me to another quilt. "I'm trying to create the sense of a kaleidoscope on the flat surface of a quilt, and one of the ways I want to do that, even though I'm doing that in fabric is to camouflage the motifs of the actual fabrics, I use very ornate fabrics partly because I just love them and can't resist them and partly because that's what helps me give the tremendous sense of activity that a kaleidoscope does. "But also since I'm trying to get that sense of spontaneity, that rare moment of serendipity when different pieces of glass find each other and are constantly moving, so by using not solid fabrics but a lot of beautiful patterned motifs, that's how I create that effect of there's just so much to look at, there's the surprise, the symmetry, the excitement that a kaleidoscope does. "When it comes to fabric, I believe more is more, you can't have too much, you should never make excuses for the size of your stash. I want it all, I want it now, I want it in the same piece and so it really relates completely to the sense of fabric that's in it. "I make quilts because I love fabric so much. A lot of quiltmakers now, art quilt makers, create their own fabric, they want the fabric to speak for them, they paint it, they manipulate it somehow. "I'm a very good shopper. 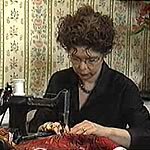 I love to shop for fabric, I have access to the garment district in New York City, plus fabric is what drew me into making quilts in the first place. I don't sew very well, but I put fabric together very well. I can basically go forward and back using my featherweight sewing machine, so 'more is more' relates completely to the fact that I want so much fabric in one quilt. "I never know what fabric I'm I mean I don't start out with a pallette. The pallette's constantly derived from what's gone on before and it's a piece in progress. It's a metamorphosis until the very last piece is put in there. So although I get an idea and I have a sense of where I'm headed, if something else says 'No, put me in there', I listen to the fabric. "I think it's just an incredible thing that quilt making brings so many different women together with so many diverse notions, there's a thread that runs through it all for us but it's the fact that we all love quilts and fabric and it provides us comradery so I think that would be a very easy thing to speak to a woman who made quilts a hundred years ago and she would appreciate my quilts and I would appreciate hers."